The second design released in the Guy Harvey Collection depicts the Snook. This saltwater fish is also sometimes known as a sergeant fish. Like many of the subjects of Guy Harvey's art, the Snook is native to the tropical waters of the Atlantic Coast and is found in the Caribbean and the Gulf of Mexico. Enjoy this marvel of the ocean with the Guy Harvey Series 2 Snook Silver Rounds! These silver collectibles feature artwork that is officially licensed from Guy Harvey. This design is offered in colorized, proof, and proof-like varieties. Guy Harvey’s “Line Dance” features a snook chasing his prey through the mangrove shallows. In the background, a posse of snook are focused on an oyster bed that is being used for cover by small fish. A couple of amberjack in the distance watch the scene unfold. Snook have excellent fighting qualities, leaping into the air and going on long runs. The challenging nature of the snook has made it a favorite of sport fishermen. The title of this piece, “Line Dance,” refers to this habit of “dancing” on the line when hooked. 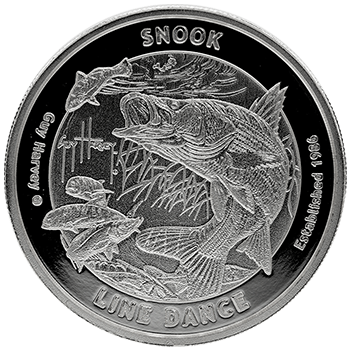 The common snook is generally found in coastal saltwater or in brackish water, but now you can find it on silver bullion with the Guy Harvey Collection Series 2 Snook Silver Rounds! These .999 fine silver rounds come in a variety of finishes, whether you're looking for silver bullion, collectible silver proof, or beautiful colorized silver. 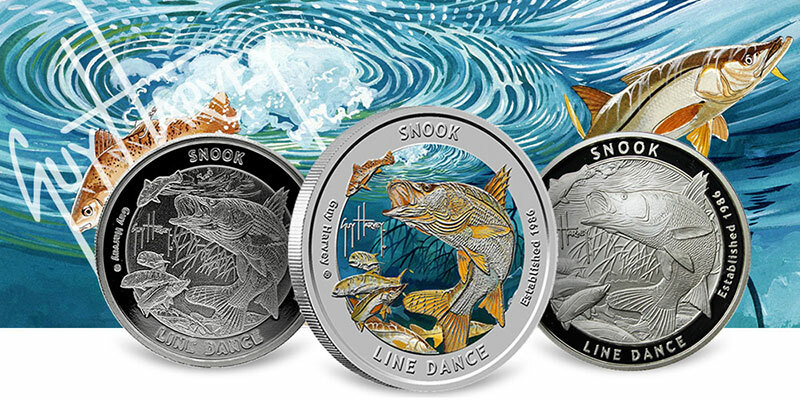 For a different take on the Snook design, collectors and investors can also choose the proof-like variety of the Guy Harvey Series 2 Snook 1 oz Silver Round. Although not entirely the same as the proof finish, this version makes use of some similar devices. It is essentially a hybrid between a Brilliant Uncirculated (BU) and proof finish, with reflective surfaces around the outer rim and the typical BU luster on the round's relief. This same finish appears on both the front and back of the round. Like its counterparts, the round contains .999 fine silver. 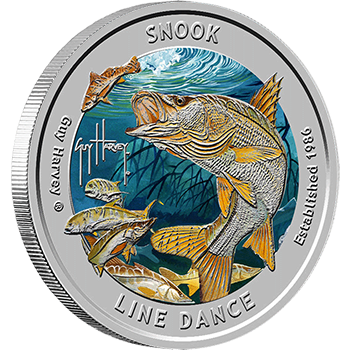 The Guy Harvey Snook 1 oz Silver Round can be enjoyed in either a traditional proof finish or a fantastic, fully colorized finish. With the proof version, the round's background exhibits a mirrored effect that contrasts with frosted relief devices. The colorized round features bright color in both the background and foreground, making the original Guy Harvey image of the Snook even more life-like. Each side of the round uses the colorization. Regardless of which version you prefer, each round is struck from the same .999 fine silver. 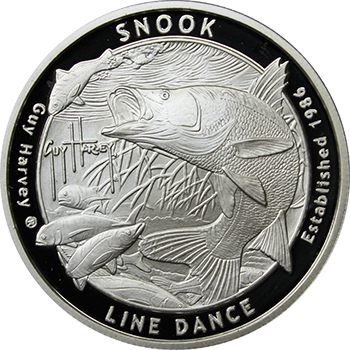 The Guy Harvey Series 2 Snook 1 oz Silver Round is also offered in a stunning proof finish. This option may be more appealing to collectors who are more accustomed to the appearance of popular coin series. Frosted relief devices set against a mirrored background bring out the exquisite detail of the Snook design and add to the round's eye appeal. The same 1 troy ounce of pure silver and .999 fine silver content are used for this silver proof, just like its counterparts.